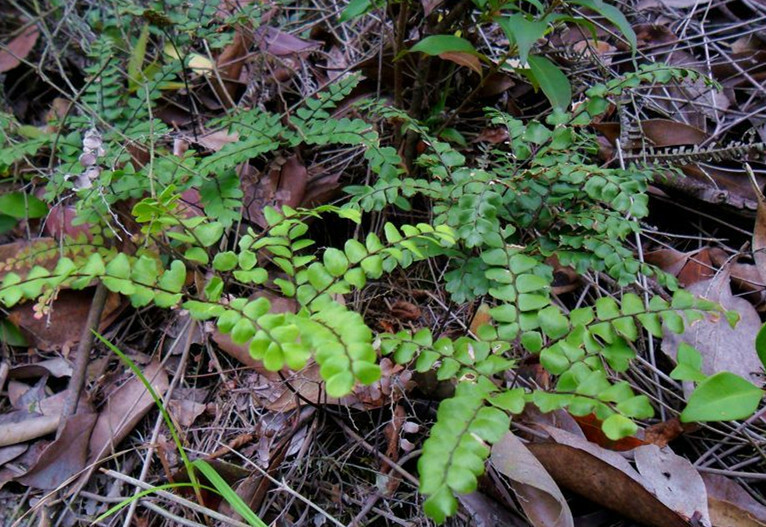 The drug is the dried entire herb of Adiantum flabellulatum L. (family Adiantaceae), growing in sunny acidic soils, and distributed in Middle-southern China, Southern China, Southwestern China and Fujian, Taiwan, Jiangxi and Zhejiang. Bitter, pungent, cool; liver, bladder, large intestine meridians entered. It is used to remove toxic heat, induce diuresis and disperse blood stasis; for the treatment of dysentery, enteritis, hematemesis, scrofula, traumatic injury, hematochezia, traumatic bleeding, urolithiasis, carbuncles and furuncles, scalds, acute epidemic hepatitis. Decoct 15~30 g, or double the dosage with the fresh. Proper dosage is for external application, pounded for applying.